In celebration of the forthcoming release of Toy Story 3 on 17 November, I’ve put up my recent review of Toy Story 1 (& 2), along with a Blu-ray vs DVD comparison. Now this whole scene has everything moving very fast, which imposes more demands on the compression system because compression by means of comparing frames loses its efficiency when the frames have relatively few similarities. Normally you don’t see this level of degradation because fast movement means marked smearing as objects move within the open-shutter period of the camera. But this computer-generated scene is razor sharp and detailed despite the movement, thus allowing the artefacts produced by the DVD compression to be visible. Anyway, there are another five comparison shots at the link. This entry was posted in Blu-ray, Disc details. Bookmark the permalink. I must say that the copy of Toy Story on DVD, that’s included with the movie on Blu-ray, is definitely a newer version than the one I’m used to watching. 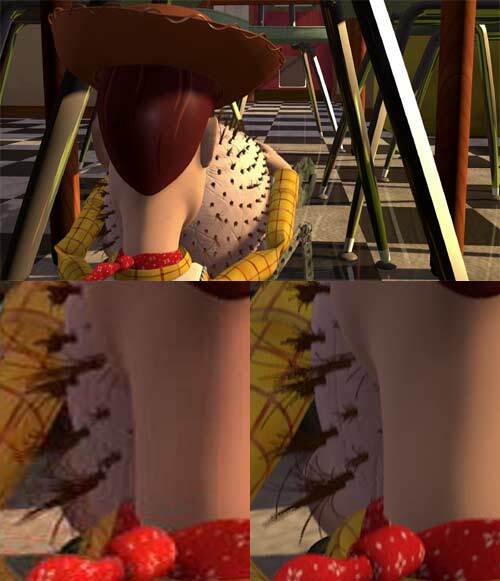 I did a comparison on my own site between the 2000 PAL DVD of Toy Story and the current Blu-ray release and, from what I can ascertain, the 2000 PAL DVD is derived from an older rendering of the movie than the current Blu-ray and included DVD; which is to be expected. As such, the difference between the Blu-ray release and the 2000 PAL DVD is a lot more apparent. Yes, I figured as much. In general when I do these comparisons I try to use the best available DVD, since my main purpose is to demonstrate how much better Blu-ray is as a format than DVD, rather than just for any given movie.